Melinda Bryant was born on June 14, 1799 in Waterford, Oxford County, Maine. 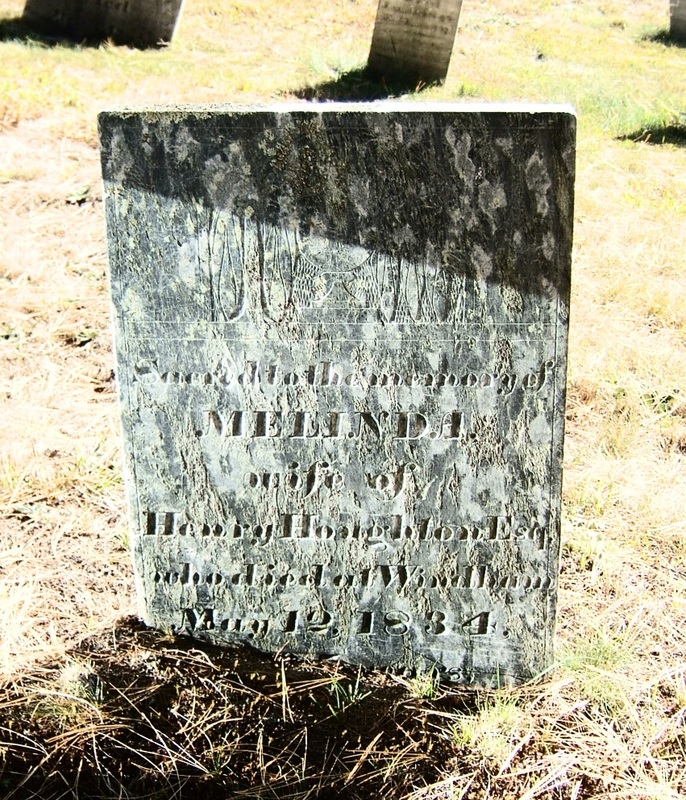 "Maine Marriages, 1771-1907," database, FamilySearch (https://familysearch.org/ark:/61903/1:1:F4X7-VJT : 4 December 2014), Henry Houghton and Melinda Bryant, 26 Oct 1819; citing Civil, Waterford, Oxford, Maine, reference ; FHL microfilm 12,625. "Maine Births and Christenings, 1739-1900," database, FamilySearch (https://familysearch.org/ark:/61903/1:1:F4SC-R53 : 4 December 2014), Mary Ann Houghton, 03 Jun 1820; citing Waterford, Oxford, Maine; FHL microfilm 12,625. 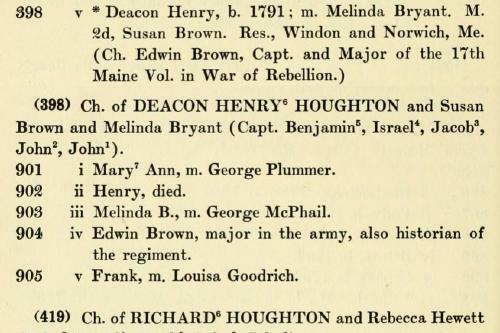 "Maine Births and Christenings, 1739-1900," database, FamilySearch (https://familysearch.org/ark:/61903/1:1:F4SZ-X6N : 4 December 2014), Henry Lewis Houghton, 25 Jul 1823; citing Waterford, Oxford, Maine; FHL microfilm 12,625. "Maine Births and Christenings, 1739-1900," database, FamilySearch (https://familysearch.org/ark:/61903/1:1:F4SC-R5W : 4 December 2014), Melinda Houghton, 16 Aug 1825; citing Waterford, Oxford, Maine; FHL microfilm 12,625. 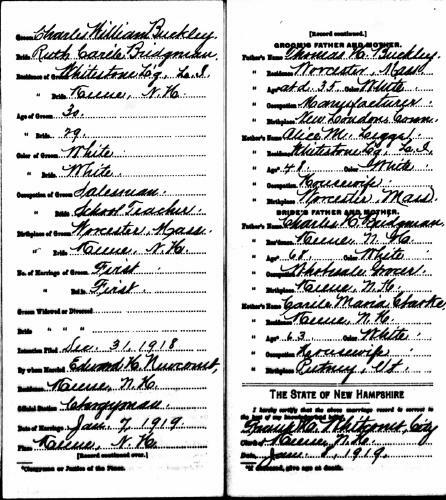 "New Hampshire, Marriage Records, 1637-1947," index and images, FamilySearch (https://familysearch.org/pal:/MM9.1.1/FLHJ-XMH : accessed 27 Nov 2012), Charles William Buckley and Ruth Carile Bridgman and null, 1919. 1900 United States. Census Office. 12th census, 1900 population census schedules, Washington, District of Columbia: Bureau of the Census Micro-Film Laboratory, ([197-]) , Census Place: Worcester Ward 3, Worcester, Massachusetts; Roll T623_696; Page: 3A; Enumeration District: 1732. 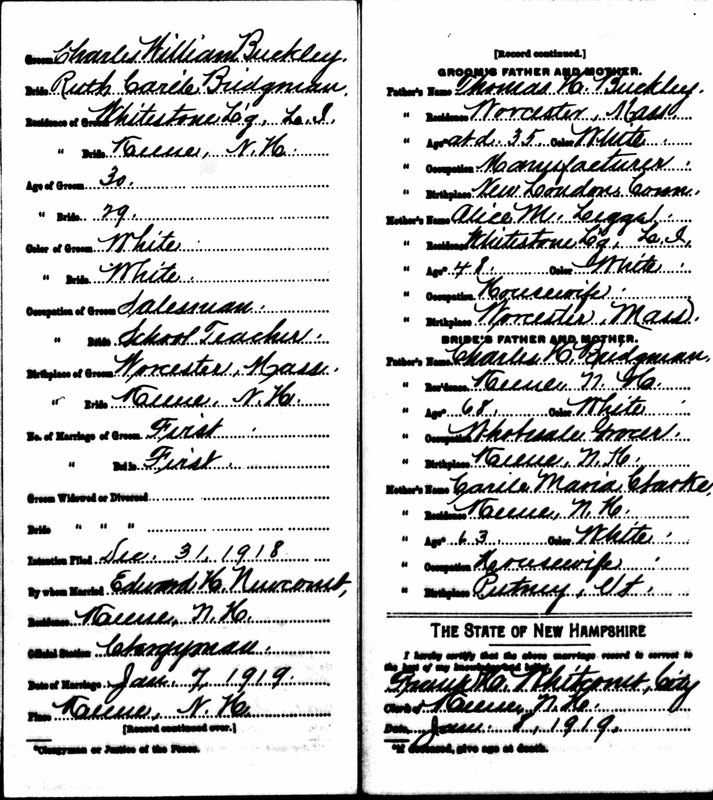 Massachusetts, Births, 1841-1915," index and images, FamilySearch (https://familysearch.org/pal:/MM9.1.1/FX6X-X1Y : accessed 27 Nov 2012), Charles W. Buckley, 1888. 1910 United States. Bureau of the Census. 13th census, 1910 population census schedules, Washington, District of Columbia: Bureau of Census Micro-Film Lab, ([19--?]) , Census Place: Boston Ward 11, Suffolk, Massachusetts; Roll: T624_618; Page: 5A; Enumeration District: 1422; ; FHL microfilm: 1374631. 1920 United States. Bureau of the Census. 14th census, 1920 population census schedules, Washington, District of Columbia: The National Archives, ([193-?]) , Census Place: Queens Assembly District 3, Queens, New York; Roll: T625_1232; Page: 3B; Enumeration District: 199; Image: 1002.
living at 281 Grafton Street, Worcester, Worcester County, Massachusetts. Massachusetts Vital Records, 1841-1910, , Fitchburg > Births, Marriages and Death > 1879. Martha Bucknam was born perhaps about 1772. 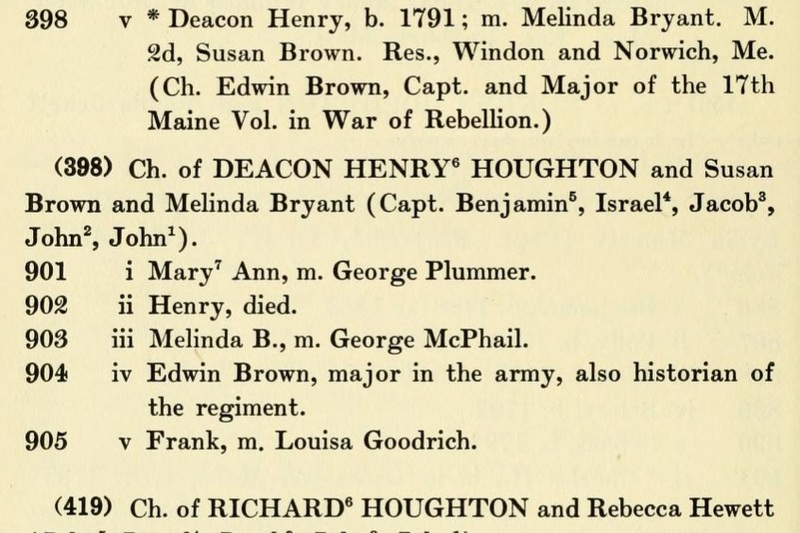 "Massachusetts, Deaths, 1841-1915," index and images, FamilySearch (https://familysearch.org/pal:/MM9.1.1/NWSJ-6CW : accessed 25 Nov 2012), Emma A. Howard in entry for Gertrude A. Legg Buel, 1892. Record added: Jan 23, 2011.